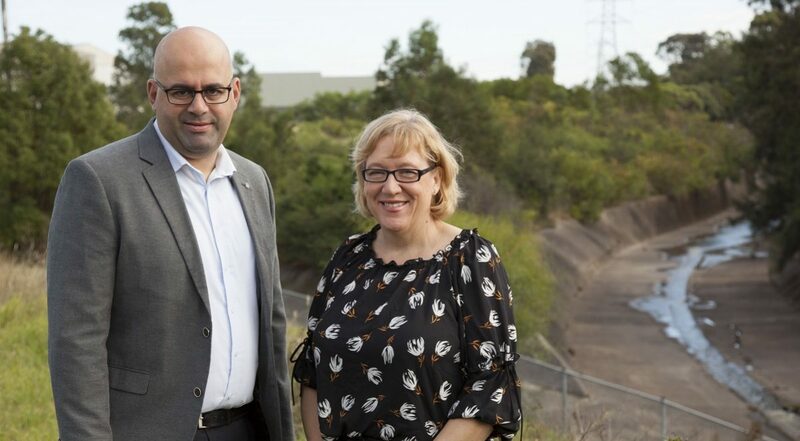 Image: Standing at the junction of Coxs Creek and the Cooks River – Canterbury Bankstown Mayor Khal Asfour and the Cooks River Alliance Deputy Chair Strathfield Councillor Maryanne Duggan. The City of Canterbury Bankstown and Strathfield Council have secured $200,000 in NSW EPA litter grants focused on cleaning up the industrial areas bordering Coxs Creek. Businesses in the Lakemba and Strathfield South industrial areas will be invited to take a leadership role in managing litter outside their premises as part of a litter prevention program run in partnership with the Cooks River Alliance. The program will start with a clean-up of the industrial zones’ public spaces after which local business will be contacted, visited, and surveyed for potential littering issues and solutions. The project will focus on the areas’ most common litter items – cigarette butts, food containers and loose waste from business operations. Councils will also increase surveillance in the industrial areas throughout the campaign to advise on good practice and, where necessary, issue fines to those seen littering, illegally dumping, or committing other offences. The project is a NSW EPA Waste Less, Recycle More initiative funded from the waste levy. City of Canterbury Bankstown and Strathfield Council were each awarded a $100,000 grant. An additional $10,000 grant has also been awarded to the City of Canterbury Bankstown to conduct a litter clean-up in the Chullora industrial area. Cooks River Alliance Deputy Chair, Strathfield Councillor Maryanne Duggan, and Canterbury Bankstown Mayor Khal Asfour said this litter prevention project consolidates both Councils’ commitment to improving the public space and environmental impact of industrial areas. “We have significantly reduced illegal dumping in the Strathfield South industrial area over the last year through monitoring and have already conducted environmental audits of each business. The area also has large litter items removed weekly by the Intensive Correctional Service litter collection program which is supported by the Cooks River Alliance and partner councils including Strathfield and Canterbury Bankstown,” said Councillor Duggan. “This litter prevention project follows the success of our Cleanest Street Lakemba Program, which resulted in a reduction in littering, particularly on nature strips, and illegal dumping in the area,” Mayor Asfour said. “It’s part of our continued commitment to educating residents about the benefits of a clean environment, as well as fostering pride in the community,” Mayor Asfour added.